When I first got into the world of Personal Development, it was less a choice and more like being shoved. I had tried everything to feel good and nothing was working – so out of total desperation I resigned myself to go into one of those Self Help sections in the local bookstore, hoping that no one I knew would see me there! The first book I found was a revelation – and I thought I’d finally “got it” But my journey was just beginning. I bought book after book, reading the same kind of books I’m sure you, as someone interested in Mind Body Spirit, have read. Books about changing my thoughts and changing my life, books about loving myself and “being present” – and books about attracting everything I want in three easy steps. And so I studied like a pHD; they say when the student is ready the teacher appears, and teachers were appearing all over the place, up close and personal. Through my career as a journalist, which had manifested in direct response to my new-found-yet-at-the-time-still-limited understanding of how we create our reality , I was able to interview my favourite teachers. I was shown new worlds and new way of seeing things which went way beyond the theory. An adventure was unfolding which would lead to me “getting it” in a profound way. 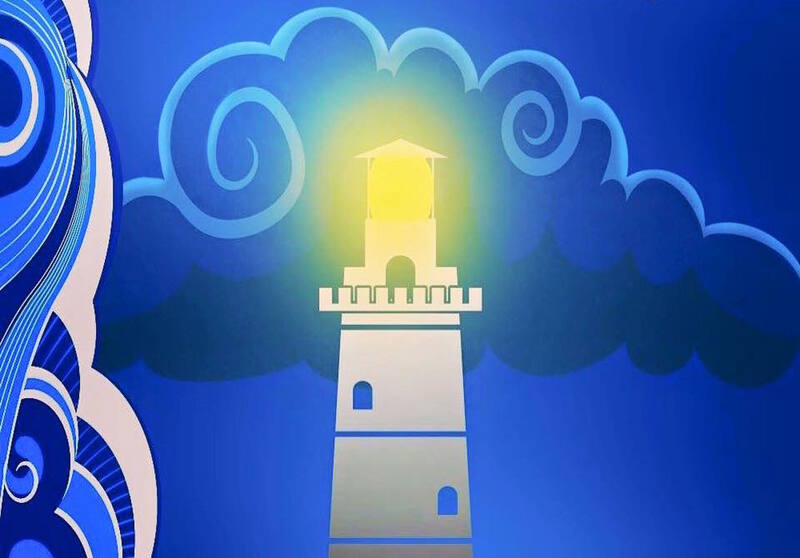 In my workshop at this year’s Mind Body Spirit Festival, I introduce work direct from my new book Lighthouse: Navigate the emotional storms of life and discover the power within you. This book is predominantly about how to practically deal with the stormier emotions of life like fear, anxiety and even depression. After all, being told to “be positive” is useless when you’re in a good mood and equally useless when you’re in a bad mood, so navigating these storms is vital to clear the way for successfully living your best life. Using my methods, I’ve seen people with 15 years of anxiety going into consistent peace of mind (and no more anxiety) in several months of my sessions – and then onto success. Two well-known personal development teachers I know both separately referred to me and my approach as a Lighthouse; having known me and worked with me – and I’m not surprised; the author Esther Hicks (Abraham) had told me of my path as an author and teacher years before it unfolded when I used to meet up with her and her late husband Jerry – and validated the unique power of my work to soothe and shift emotion. This seems to be one of my skills, having battled my own demons, found my way out and then helped hundreds of others do the same. And I will share what I know in this workshop. I remember meeting with the publishers Hay House about a previous book I was writing where, as I was leaving, one of the team commented: “I’ve spent two hours with you and I don’t know who you are – you’re a real enigma”. I smiled to myself as I walked out (who doesn’t like an air of mystery) – but as fascinated as I assumed she was by me, what she said hit home: I had kept my own life out of my writings. Until now, that is. Following her nudge, for the first time I have included my own personal story in this book, which shows how we can find peace no matter what the circumstance – and paints a picture of how my own challenges have shaped my current life and helped create a book such as this. On my own journey, I got disillusioned with all the positive thinking books, and I couldn’t get to grips with what they said. Reading books that tell you that you ought to simply “be positive not negative” are great in theory, but not so much in real life – and hardly tell us something we don’t know. Books about the Law of Attraction can get you on a never-ending road to “attracting a better life tomorrow”. And that tomorrow never comes. I’ve seen people buy into this stuff, take workshop after workshop, on their way to “manifesting a dream life” only it never quite happens for them. The thing is, I’ve got to know several Great Big Huge proponents of this “three steps to success” formula and guess what… It doesn’t work for them either. With my background as a current affairs journalist coupled with a natural interest in religion and spirituality, and a fascination with the bigger questions of life, I’ve been on the search for truth. And looking for something that actually worked to improve the quality of mine and other people’s lives. Not empty theory, not gimmicks… I wanted to find solutions: Can we affect our life experience? Can we heal our bodies? Can we become more confident? Can we manifest our dream lives? How do we enjoy more loving and fulfilling relationships? Can miracles happen? Can we overcome our thought habits and find peace of mind? And if we can, how do we do it? So – I’m going to make a statement of my findings to-date: I have little doubt about the extraordinary power we have within us. I have personally witnessed many powerful, you could say “miraculous” results in all areas of life – including physical healing – in myself and others. I’ve seen people move into their dream lifestyles and careers using the ideas I share. And I’ve seen people really starting to enjoy their lives more and get out of those miserable habits of depression and anxiety, and truly learn how to navigate the emotional storms of life. Come and see me on Monday 1 May at 10:45am.